This paper discusses the general chartering strategy trends for oil companies and provides a systematic approach for strategic tanker chartering decisions focusing mainly on the shipping contract mix problem. 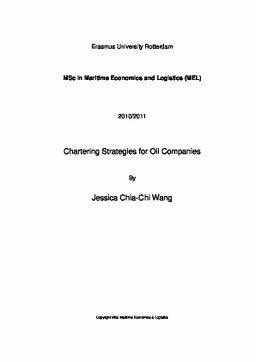 To analyze trends in chartering strategies, this thesis categorizes oil companies from an oil supply chain perspective into four main categories; integrated oil companies, oil producers, oil consumers, and oil traders in order to identify different levels of involvement in crude oil transport and composition of shipping contracts. In terms of contract mix analysis, Modern Portfolio Theory and a non-linear model are introduced as the main methodology to analyze the optimal shipping contract mix. A contract mix case from an Asian based oil company is then provided utilizing introduced theories and models to find the optimal shipping contract mix.